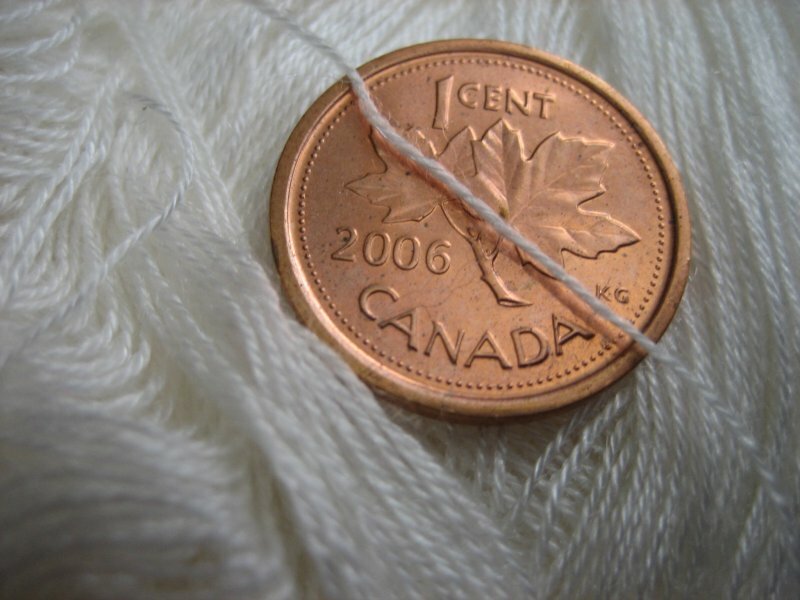 The Knitting Pirate » In Which the Pirate Provides Pictures. « In Which the Pirate Is Surrounded. In Which the Pirate Provides Pictures. 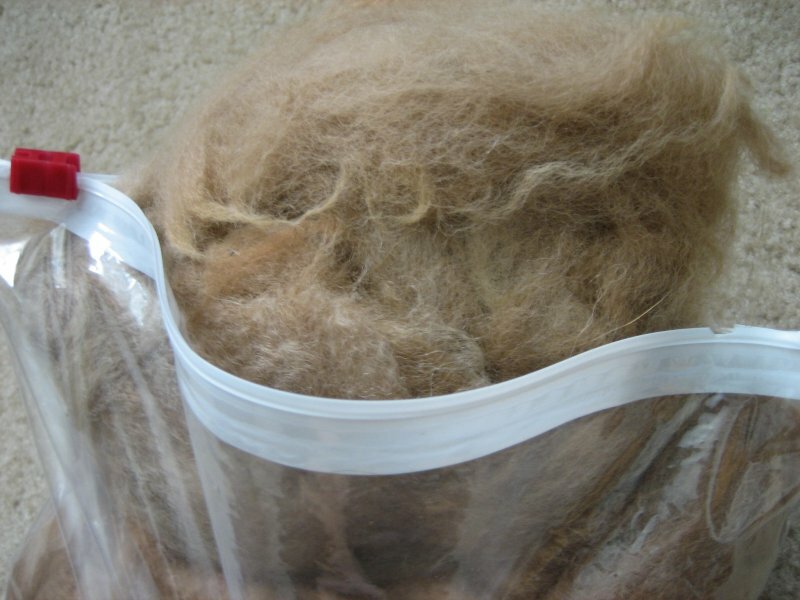 This is just a few ounces of the eight *pounds* of fleece currently awaiting rotation through the freezer. I am thrilled to have it; I just need to decide what to make! Alpaca mittens would be nice, or maybe those fingerless gloves I keep thinking of - or maybe convertible fingerless glove mittens! Yeah! 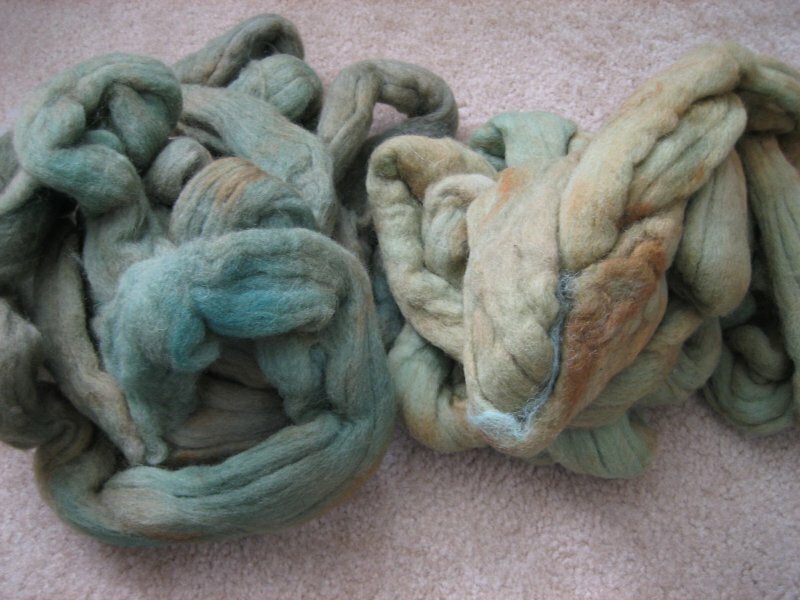 Unfortunately, pictures of this green roving don't do the color justice at all, though I tried and tried. I found two bags of the same color, but they were obviously two different dye lots, so I'm going to card them together and split the difference. It's very tightly compressed right now and feels a little bit rough. Originally I was thinking of making a hat with it. If it still feels rough when I card it, I might have to change that idea, or make a lining so it's not too itchy on my head. Here's an older picture of me, from two years ago, but there are my eyes... and there is this roving. It's incredible. I've never found anything this color before, so if I'm ranting a little, please forgive me! 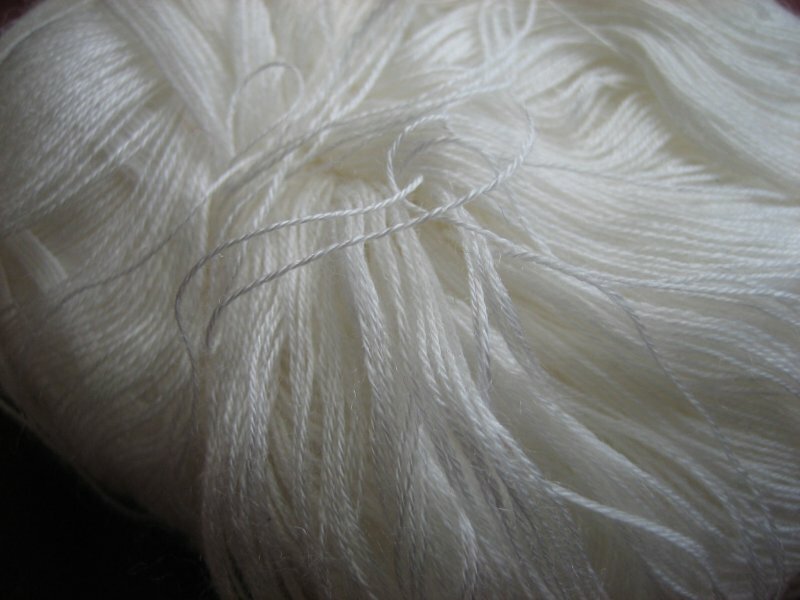 Another thing I bought at Pennsic is this cobweb-weight silk/cashmere blend. It's the same as the coppery brown stuff I already have, and bought from the same person. She says she keeps this and several other colors in stock, or I'd've been tempted to purchase two spools of purple as well. it's amazingly fine. I spent a long time in front of the tent just admiring the different colors and gently touching the yarn. When Pirate-Husband picks out a pattern of lace that he likes, I'll put the project in my Ravelry queue. I'm certain that I will be able to make two cuffs for him by next Pennsic. If I make it three times the circumference of his wrist, it should ruffle nicely from the cuff of his shirt and look really spiff! Speaking of lace, here is the Ostrich Plumes progress, gently pinned out this time so the pattern shows up better. I'm still not sure how long I should be making this, but I'm developing a reputation for dressing however I please and still pulling off the look - so I'm confident that it will look good whether it's short or long. I'll just wrap it around my neck and go. How could it be bad? 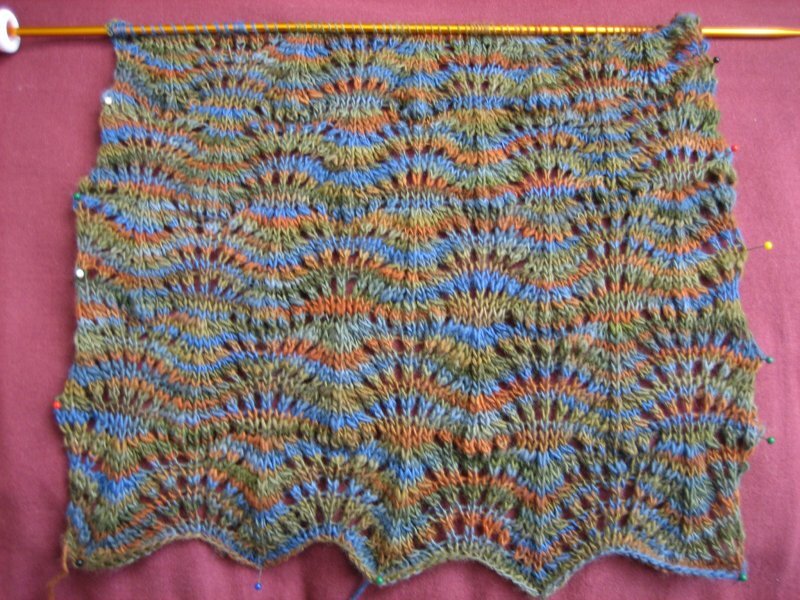 The Stripey Striped Scarf ought to be finished before autumn, since I really want to wear it with my gray coat. I am so pleased with the way the colors are playing out! It doesn't seem like it should work, then for some reason it does. It may sound egotistical to say this, but I'm going to say it anyway: one of my motivations for finishing the scarf is to hear other people's reactions to it when I wear it. And now, the Jaywalker. By some miracle, I got the second sock to start in almost the first place as the first sock. I think the color is only off by two rows. I'm going to start the heel in the same place so that matches, because no one will notice if my socks are an eighth of an inch different in height, even me, especially if they slouch a little. I love that the tip of the toe and the tip of the heel have that tiny little bit of light blue in there. If both socks have that, I shall be very pleased indeed! 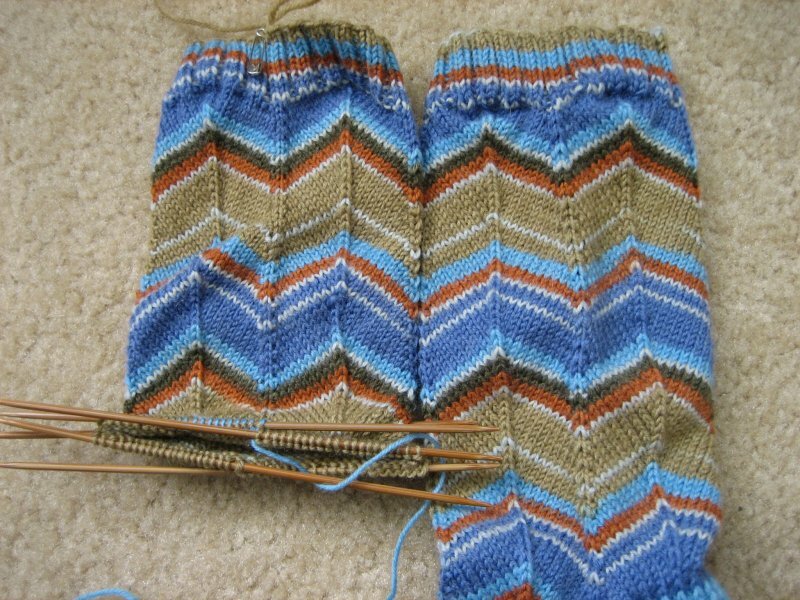 Once the Jaywalkers are done, I'm going to go back to the Pomatomus sock and make a mate for it. After that... well, I really want to start designing my own socks. 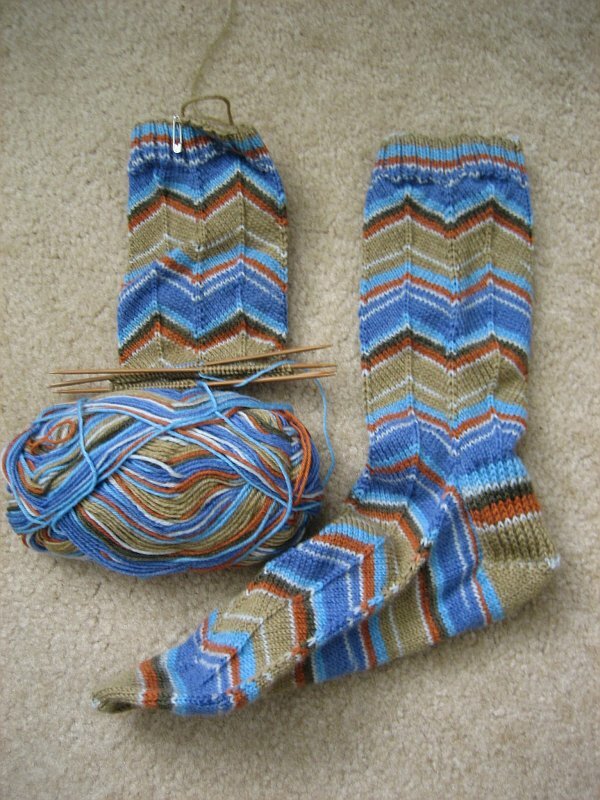 I've been really inspired by the patterns that Wendy has been coming up with during the Summer of Socks, and I've had some great ideas (at least, I think they're great) for patterns of my own. And I decided not to take any pictures of the Ninja's Sekrit Yarn Gift. She's just going to have to wait until I see her in person! 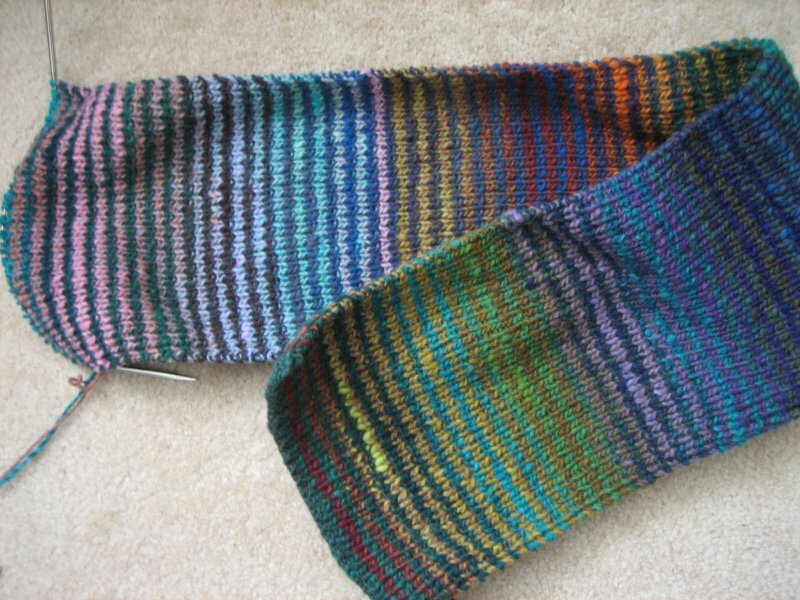 This entry was posted on Saturday, August 25th, 2007 at 13:40 and is filed under fiber, jaywalker, lace, ostrich plumes, scarf, sock, spinning, stripey striped scarf. You can follow any responses to this entry through the RSS 2.0 feed. Both comments and pings are currently closed. I liked seeing your ostrich plumes.. I just got the pattern and am ready to cast on.. I was dissapointed that there wasn't a chart. Did you make a chart for yours? Is it easily read without it?. I think charts are lifesavers.